Chats are very popular in India for its addictive sooper taste and aroma. 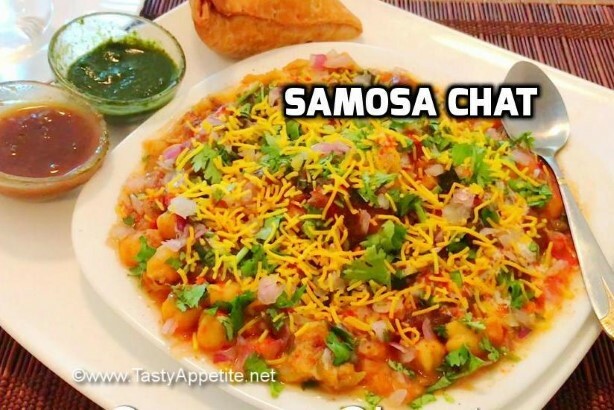 Samosa chat is one of the famous chat recipe that tastes mildly spicy, sweet and tangy with irresistable flavors from spices. This lipsmacking chat recipe can be prepared at home very easily. The samosas are mashed and soaked in thick masala prepared & served with chilled yoghurt. Check out the easy recipe here! Video Recipe For more video recipes subscribe here! Wash and soak chana in water for 6 to 7 hours or overnight. Drain water and set ready. Store the water to add later in the masala. Add sliced green chilli, onions and saute for a minute. Add mashed tomato and saute until oil separates. Add turmeric pwd, salt, red chilli pwd, coriander pwd and cumin pwd. Add cooked channa and toss with masala. Add drained water from the cooked chana and adjust the thickness of masala. Add finely chopped coriander leaves. Add samosas to the masala and mash it well. The spicy masala is ready. Add masala along with mashed samosa to the plate. Top up with few tsps of sweetened curd. Sprinkle cumin pwd, chat masala pwd & red chilli pwd. Garnish with finely chopped coriander leaves and spicy sev. Lipsmacking delicious homemade samosa chat is ready. Enjoy hot with garma garam chai /coffee. For the lastest food recipes, health tips and updates, like us on Facebook, subscribe on Youtube or follow us on Twitter.